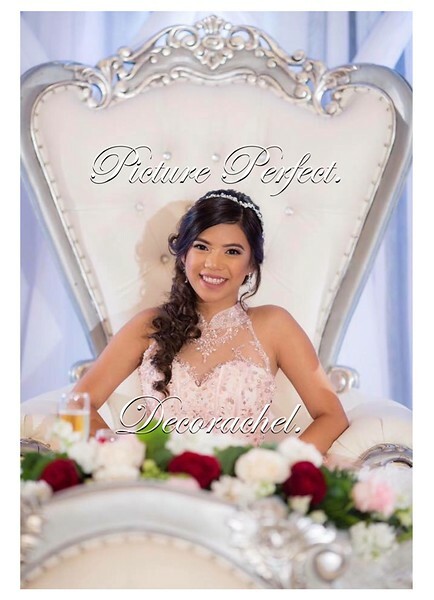 PicturePerfectDecorachel.com ^.~ BACKDROPS • CEILING DRAPES • GOBO & LED Up Lights • CHIAVARI CHAIRS • PHOTO BOOTHS • ROYAL CHAISE & LOUNGES • BALLOONS and more! WEDDING INSPIRACHEL * * EXCEPTIONAL QUALITY. AFFORDABLE PRICE. * * We have been providing Stylish and Elegant Decorations in Southern California since 1996. * Our Goal is to Make Your Wedding the Perfect Event and Do Everything Possible to Create a Lasting Impression of a Beautiful and Remarkable Day Full of Love, Joy & Happiness. * Let Us Transform Your Venue from Ordinary to Extraordinary and turn Your Special Day into a Sensational, Memorable Event by Creating Sophisticated Decorations for a Very Reasonable and Competitive Price. * Your Special Day is Special to us too. * Make it Last a Lifetime! * * * ROYAL WEDDING CHAIRS • Stylish BACKDROPS • Elegant CEILING DRAPINGS • LED Up Lights • GOBO Monogram Lighting • PHOTO BOOTH S • Chiavari Chairs • Chair Covers • WALL TO WALL Drapings • BALLOON Decorations • Royal Greek COLUMNS • Table Linens • Overlays • Chargers • Candy Bars • Stage Decorations • MANDAPS • Decorations for all occasions ^.~ Celebrate the moment! Celebrate with style! CELEBRATE what matters most ~> Family + Friends + Life! GOD BLESS! !